Thanks, I'm probably going to compress and upload to my FTP. The file you provided is a stub which will eventually stop working, but I now have the complete download. Correct, but I did test the link before I posted, and it still works. Unfortunately, the same cannot be said for the 64-bit links; I have just worked my way backwards through version 43, and none of those work. Standard release channel for Adobe Flash Player has been updated today to 32.0.0.156. The standard SHA 256 installers are confirmed working on Windows XP SP3. I've been prompted with a new Flash Player update window. As a sad side-note, Shockwave went EoS today. The last one is v. 12.3.4.204. RIP! I don't think I've ever had success using the built in auto update functionality. (At least, not recently). To ensure I have the latest version I always use the "current" links. While you could argue the SHA2 won't run on SP1 or SP2, I have no reason to run anything older than SP3. For example, my HP all-in-one printer that I bought a few months ago requires a minimum of SP3 along with Internet Explorer 8. Windows XP will be supported straight through the end of Flash Player support next year, so there's no risk of downloading a new version that incompatible with Windows XP. Adobe itself said as much in its July 25, 2017 press release Flash & The Future of Interactive Content. "Adobe will continue to support Flash on a number of major OSs and browsers that currently support Flash content through the planned EOL. This will include issuing regular security patches, maintaining OS and browser compatibility and adding features and capabilities as needed. We remain fully committed to working with partners, including Apple, Facebook, Google, Microsoft and Mozilla to maintain the security and compatibility of Flash content." I never recommend the SHA1 links with the embedded version numbers because they go dead as soon as a new version is released. 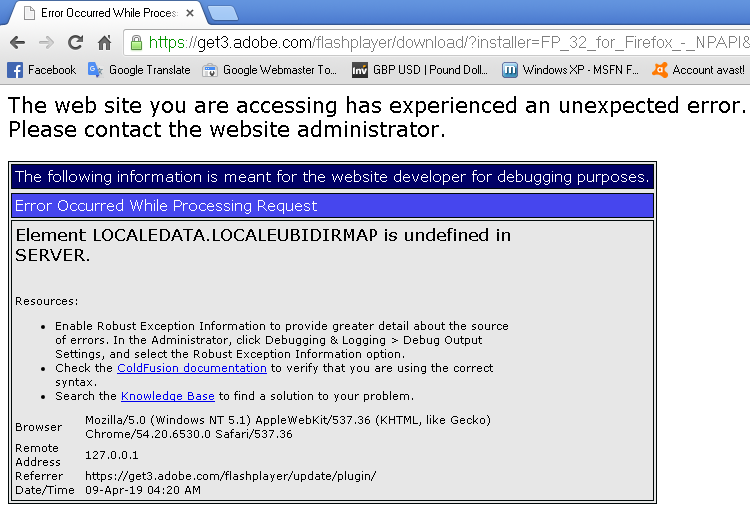 Such as http://fpdownload.adobe.com/get/flashplayer/pdc/32.0.0.156/install_flash_player_ax.exe, http://fpdownload.adobe.com/get/flashplayer/pdc/32.0.0.156/install_flash_player.exe, and http://fpdownload.adobe.com/get/flashplayer/pdc/32.0.0.156/install_flash_player_ppapi.exe. Also my Windows 10 Java installation has updated from Update 202 to Update 211, instead of 212! There now seems to be no way of getting the Update 212 files without having an account with Oracle.